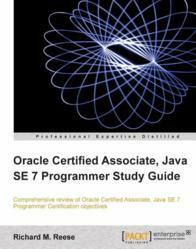 Oracle Certified Associate, Java SE 7 Programmer Study Guide addresses certification exam objectives and provides discussion and examples to show the best ways of applying Java language features in real world programming. Packt is pleased to announce the publication of Oracle Certified Associate, Java SE 7 Programmer Study Guide. Written by Richard M. Reese, this study guide will provide an in-depth understanding to readers of Java through the examination of objects and methods and the run-time Java environment using varios illustrations. With over 17 Years of experience, Richard M. Reese has worked in the IT industry including operating system development at GTE Automatic Electric Labs and at Lockheed Martin in Fort Worth, Texas. He is a certified Java SE 7 Associate Programmer and holds a Ph.D. in Computer Science and is currently an Associate Professor in the Department of Engineering and Physics at Tarleton State University in Stephenville, Texas. Oracle Database helps customers lower IT costs and deliver a higher quality of service by enabling consolidation onto database clouds and engineered systems like Oracle Exadata and Oracle Database Appliance. It's proven to be fast, reliable, secure and easy to manage for all types of database workloads. Oracle Certified Associate, Java SE 7 Programmer Study Guide will enable developers to manage the stack and the heap in Java run-time system, support string operations, declare and use one and two dimensional arrays, control access to class members and handle exceptions. Furthermore, it will help them understand the program structure and the scope and lifetime of variables, inheritance and the use of polymorphism. This book contains extensive code examples and figures to illustrate key concepts in Java SE 7. Moreover, this book includes additional and step-by-step coverage of good programming design practices and certification exam topics in a simplified and easy-to-learn manner. Readers will also be able to apply good programming techniques to build their applications.